This is the fourth part of Making Sense of Auto Layout Series. Previously, we have explained why missing constraints appear and how to solve them. 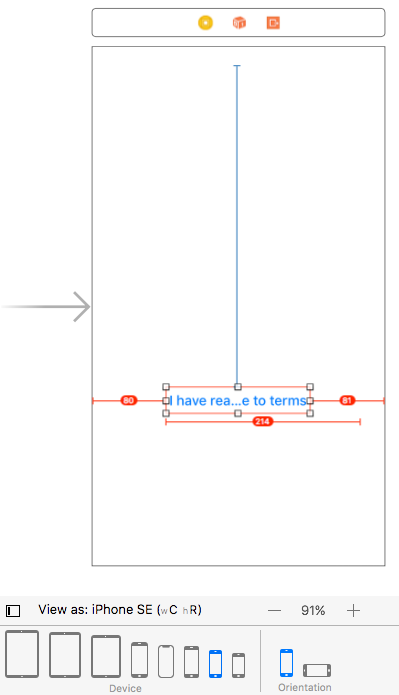 In this post we will look into why Xcode shows you red lines with numbers when designing layout and how to solve them. Ever experience that you finally got rid of all the red lines and it looks good on your device, but when you view it on another device in simulator, it look totally off? This is probably because you have conflicting constraint in the layout, we will use a simple example below. The example contain a vertically centered button. It looks good and all the lines are blue, yay! Enough constraints are defined and Xcode is able to calculate the x position, y position, width and height of the button. Hmmm... so whats with the conflicting constraints? Remember how Auto Layout calculate size of a view? We will first discuss why the layout works fine on iPhone X. So the width of button is 214 by calculation of leading and trailing constraints we have defined. But remember we also explicitly defined the width of the button to 214. Since the explicitly defined width is equal to the width derived from using leading and trailing constraints, Xcode doesn't complain. We calculated that the width of the button should be 159 points using the leading and trailing constraint. But since we have another constraint explicitly mentioned the width of button to 214, Xcode got confused (use 159 as width or 214? they are conflicting 😫) thus showing you red lines with numbers. Auto Layout Engine can't satisfy all of the constraints as it is impossible to set the width of the button to 159 and 214 at the same time. Thus to render the button on screen, Auto Layout Engine will break (ignore) one of the constraints , in this case, the explicit width 214 constraint will be ignored. After breaking (ignoring) the width 214 constraint, Auto Layout Engine will use the 159 as width of the button. As the width is too short, the text in the button got squeezed. When there are several conflicting constraints while the app is running, Auto Layout Engine will start to break constraint one by one with a certain order until there is no conflict in the layout calculation (size and position) then only render the layout. To resolve conflicting constraint, click on the red icon with white dot and select the constraint to delete. In this example, we will delete the explicit width 214 constraint so that the width of the button can be dynamic depending on the screen width. 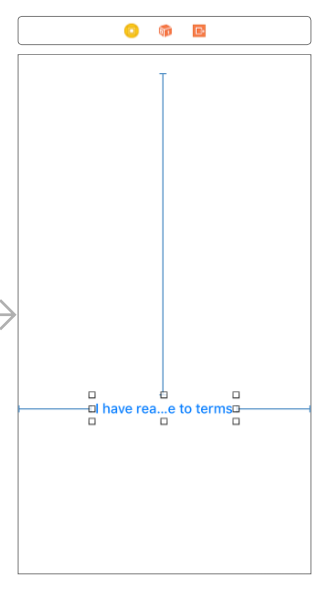 After deleting the conflicting constraint, Xcode doesn't confuse anymore and show us blue lines on the iPhone SE screen (and other screen size too) , yay! Ahh the text still got squeezed because the width from calculation is too short, we need to reduce the distance from screen left and screen right. This is straightforward so I won't further explain it here. Conflicting constraints usually happen when you have defined too many constraint on an UI element causing Auto Layout Engine unable to satisfy all of them. 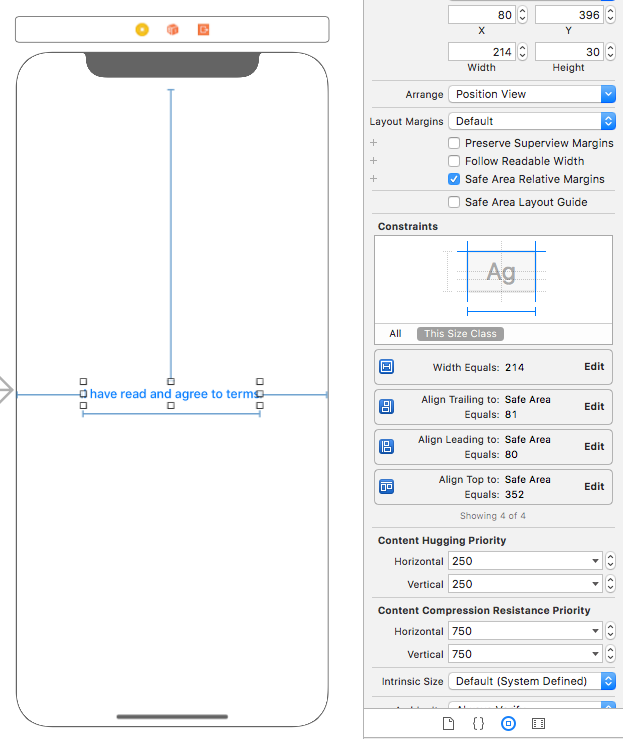 I noticed quite some beginner iOS Developer is prone to making conflicting constraints because they usually design UI for only one device type (usually the iPhone model they are using) in the Interface Builder during development. They might unconsciously place excess constraints and Xcode shows blue lines on the device they are designed to. But when they have finished developing the app and release it to friends or beta tester, the layout problem arise as different screen size is used. To prevent accidentally placing conflicting constraint, be sure to switch between different iPhone model when placing a new UI element / deleting an existing UI element in the Interface Builder. In the next post, we will look into what is intrinsic content size and the usefulness of it.